So I’ve mentioned Pinterest a lot lately – I kind of love it. It’s such a guilty pleasure. Pinning places that I want to visit, things I could never afford for my imaginary home, and clothes that cost more than my rent each month is highly enjoyable. I also love the fact that the site has lots of DIY ideas for things around the house and innovative recipes! I came across one a month ago for pumpkin cupcakes. It’s extremely simple, just two ingredients. A box of yellow cake mix and an 8 oz. can of pumpkin pie mix, combined in a large mixing bowl and beaten for a few minutes until fluffy. Go-GO KitchenAid Mixer, whipped these up in no time! 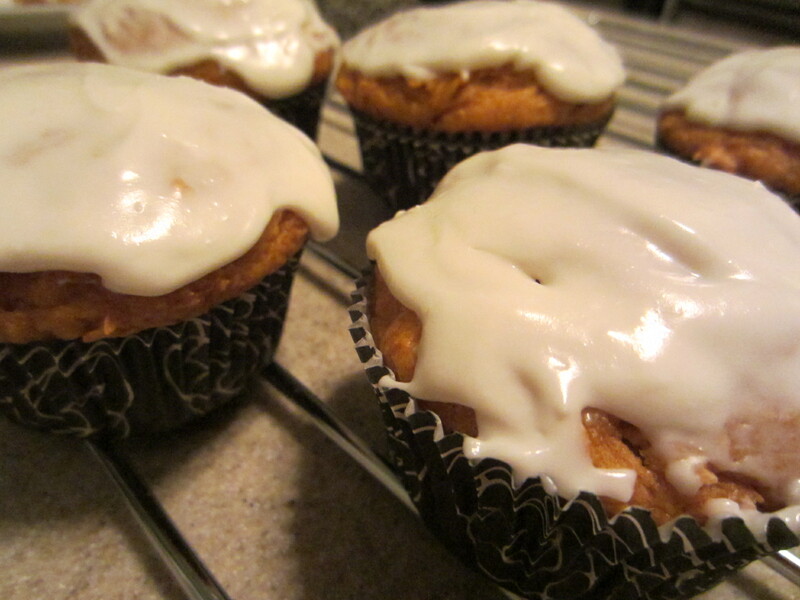 I used storebought vanilla frosting for them, but they would also be great with cream cheese frosting. Also used Halloween cupcake wrappers to make them more festive! YUM! Enter your email address to follow the adventures on Bloggin Holiday and receive notifications of new posts by email!